Having an upcoming trade show? 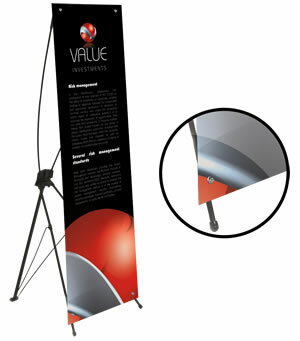 Order X-Frame Banner from Print Factory to maximize your exposure at the trade shows. Very price effective print material for the events and for usage in the office as an advertising piece. When disassembled, our light-weight x-frame stand is very compact, which is perfect for transportation and does not take a lot of room. Our X-Frame Banners include FREE travel bag. Let our designers to come up with an outstanding and creative design for you next x-frame banner. Our designers have an extensive experience in designing trade show materials, so you can be assured that your print material will be impressive and will deliver the right message to your potential clients. Would you like to know more about X-Frame banners? Please contact us today and our product specialists are always happy to assist you over the phone, via email or in person.